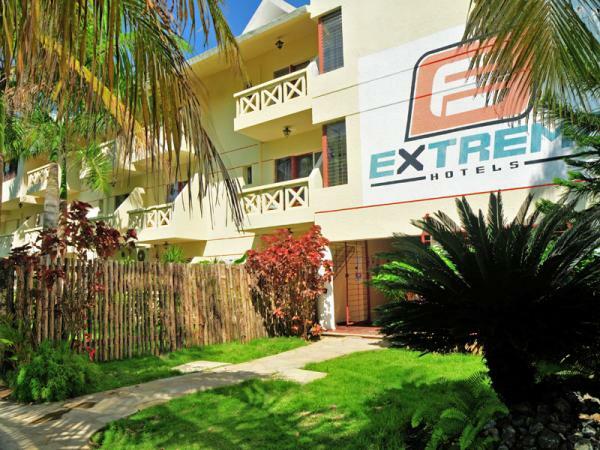 Extreme Hotels Cabarete provides a new breed of kitesurfing and sports vacation on the north coast of the Dominican Republic. It is a unique, environmentally friendly, adventure, and kitesurfing themed hotel located in one of the world’s premiere kitesurfing and surfing destinations. We cater to multiple types of vacationers: from families to solo travellers, all looking for a fitness, sport, or adventure vacation in the sun. Our world-class fitness facilities include an amazing, thatched roof crossfit gym; a flying trapeze and circus school; a beautiful yoga loft overlooking the ocean; a kiteboarding school; a healthy, family-owned restaurant; and so much more. It’s a fun, friendly vibe that you won’t want to leave! You can spend your day kiteboarding, surfing, getting fit at the gym, relaxing in a yoga class, or learning to fly like a pro on the trapeze. Never tried kitesurfing before? No worries, we specialize in beginner packages with rentals, lessons, and unlimited supervision so you can be out there kitesurfing with the best of them in no time at all. Kite Beach, Cabarete is a great place to learn with consistent trade winds and thermal winds to add an extra boost in the afternoon. Come join the Extreme Vacation and experience Life by the Sun! Thanks to our customers for voting us one of the best hotels on Trip Advisor three years in a row!